Clean and simple lines set this gazebo apart from all others. Dramatic yet functional, the Grandview can be placed in a commercial or public setting, or customized for private use in your yard, deck or patio. The Grandview comes fully screened, or can be outfitted with sliding glass storm windows for three-season application. 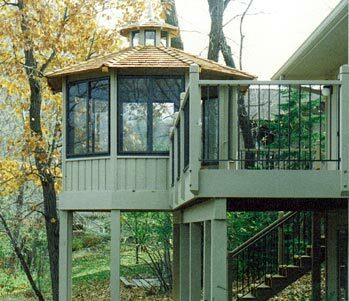 The Grandview model can be augmented with glass windows, allowing the homeowner to enjoy their gazebo much like they would a three-season porch.